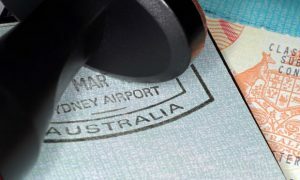 Australia’s migrant intake will be substantially down this financial year – possibly 25,000 below the 190,000 planned figure – led by reductions in the number of skilled and sponsored working visas. The migration program has been at 190,000 since 2012-13 but dropped to 183,000 last financial year and will fall further again this year. Figures disclosed at Senate estimates and visa statistics reveal the number of visas granted in 2017-18 is likely to be 165,000 – the lowest level in seven years. To 30 April this year the Australian government had granted 138,086 permanent visas divided broadly into two-thirds skilled, one-third family (and excluding humanitarian visas, which sit outside the migration program figure). “It’s probably down on where we were this time last year,” a first assistant secretary for the Department of Home Affairs department, Christine Dacey, told estimates last month. Extrapolated to the full year ending 30 June, it appears likely about 165,000 migration visas will be granted. The figures obtained for the first six months of the 2017-18 financial year show a 15% drop in the number of permanent visas granted, from 92,477 to 78,190. Comparing the first six months of the 2016-17 financial year with the first six months of the 2017-18 year, the figures show substantial falls across most visa categories, but most particularly among skilled independent and employer-sponsored work visas. The number of employer-sponsored visas fell from 22,843 to 16,047, driven largely by changes to the 457 visa regime. Skilled independent visas officially fell from 24,289 to 20,989. This large headline fall masks a significant change in the makeup of the program. A deal struck between Canberra and Wellington now enables some New Zealanders who have lived and worked in Australia for five years to apply for permanent residency, and a pathway to citizenship. These are likely to displace thousands of other skilled migrants who might otherwise have been granted a permanent visa in the migration intake. Figures released in April show more than 9,000 New Zealanders have applied to take up this option. Fewer migrants were sponsored by states, territories and regions, while business innovation and investment visas (for people starting a business in Australia) were largely unchanged. Media reports have suggested that cabinet this year discussed lowering the planned migration figure by 20,000 but that it was rejected. Ministers have variously denied that the figure was debated, or stated that debate over the size of Australia’s migration program was part of regular discussions within government. The home affairs minister, Peter Dutton, has said the government already had, and would reduce migrant numbers “where we believe it’s in our national interest”, citing traffic gridlock and unaffordable housing in cities. But he also said he supported immigration at its current levels. While issues around choked roads, strains on schools, hospitals and other infrastructure, and house prices are politically sensitive for the government, migration adds an estimated 1% to Australia’s gross domestic product every year, Treasury modelling indicates, because it counters Australia’s ageing population (migrants tend to be younger than the average Australian). Over the past two decades the country of origin for most migrants to Australia has shifted from places like the UK and South Africa, to China and India. A 2016 Productivity Commission report predicted the population would reach 40 million by 2060, and argued the future size of Australia would be largely determined by the country’s migration policies. All materials on this site are protected by copyright, including design. You may not copy, distribute, including by copying to other sites and resources on the Internet, or any other use of the information and facilities without prior authorisation. © Sydney Migration Group Pty Ltd., 2009-2019. Prior results do not guarantee a similar outcome.